Stunning sun-filled two-level contemporary located in sought-after Twin Ponds area of Pound Ridge. Every detail of this home conveys elegance, style, and warmth with optional one-floor living, open floor plan, exterior cedar and stone, two massive fieldstone fireplaces, wide oak floors, hand stained wood moldings, custom kitchen and library & more. House is extensively rebuilt with meticulous attention to detail and quality of construction. Anchored into bedrock, this house is built to last. Designed for celebrating all seasons of the year, this home will fulfill your dreams. This light-filled house is situated above one of the crystalline lakes, fed by fresh spring water all year. Enjoy viewing beautiful species of fish, birds, and other wildlife while boating in your own secluded natural setting. First level: Master bedroom and bath, Great room with oak beamed cathedral ceiling, 16' soaring stone fireplace and wall of windows, Chef's eat-in kitchen overlooking lake, formal Dining room, 2nd & 3rd bedrooms. First and second levels offer Brazilian IPE (iron wood) decks with beautiful lake views from kitchen, bedrooms, dining room, bathroom, and 1st and 2nd level entry. Second level: Custom cherry wood library/family room, office/exercise room, 4th bedroom, full custom designed bathroom with sit-in shower, IPE deck leading to lake. Basement: Third level that houses utilities. Property: 3.19 private acres. Belgian block lined driveway lighted by three elegant imported lampposts. A fieldstone walkway and steps lead to the front entrance. At the rear of house, stone steps wind gently among rock outcroppings and trees down to your water-front and your private dock. 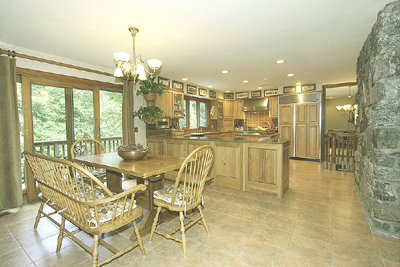 A substantial part of the lake is included in the acreage. Relax in your private park of magnificent oak and beech trees alongside mature evergreens that surround this property. Residence: 4,800+ sq ft 10-room house Great/living Room, four bedrooms, library/family room, three bathrooms, one powder room. Front entry leads into foyer on main level overlooking lake. To left of foyer is exquisite Living/Great room with oak-beamed cathedral ceiling, chefs eat-in-kitchen, formal dining area, powder room, and master bedroom and bath. To right of entry are formal dining room, two more bedrooms, limestone bathroom and two car attached garage. Custom oak banister defines stairs leading to level that proudly displays breathtaking scenic views of water and a deck where you can enjoy your breakfasts and feast over your own nature reserve. This level also includes custom-built cherry wood library/family room with Fieldstone fireplace, 4th bedroom, office, and bathroom with large tiled sit-in shower.